Despite the name, smartphones are often quite dumb as there are many tasks these devices struggle to do. The Mobile World Congress in Barcelona saw the launch of software aiming to try and solve some of the bigger issues such as handsets not playing Flash videos. Despite the majority of video, animation, and many games on the net being Flash based, the system is not yet fully supported on handsets. David Wadhwani, vice president of Adobe, said: "We'll see over the next 12 months Flash player 10.1, which is the same version of Flash on desktops, running on a variety of smartphones." The mobile download of Flash 10.1 will be available from this summer on Android and Palm Pre handsets - and with other manufacturers to follow. Currently 19 out of the top 20 manufacturers have signed up to support the video and animation platform. The update will not be available on the iPhone because Apple has decided not to support the software. Firefox has finally brought its popular browser to the mobile. It will feature tabbed browsing, session syncing between mobile and desktops, and currently includes 40 add-ons to make it among the most customisable browser on a handset. The Twitter add-on allows the user to tweet from the address bar. Firefox is already available on Nokia's N900 and will be downloadable to other handsets throughout 2010. Opera has also produced ultra-fast mobile browser Mini for the iPhone which is yet to be submitted for App Store approval. The company claims it will load pages up to six times faster than the iPhone's current Safari browser. One of the most anticipated events at the 2010 MWC was the launch of Microsoft's new mobile platform Windows Phone 7. Due to be finished in November, the operating system has a more natural and lifestyle-led feel. The name change from Windows Mobile to Windows Phone does not mean the firm will start making phones. Instead it reflects a move towards personalising what used to be a very PC experience. One way it has done this is by taking the Start button off the software, and bringing in live tiles to show friends' updates in real time. Microsoft has also replaced the Windows Media Player with its Zune music service to create a tool similar to a built-in iPod - Microsoft said Zune would sync with iTunes as well as computers. There is also live integration with Microsoft's Xbox 360 gaming console which means a user's profile, avatar, top scores, and notifications are all kept up to date. 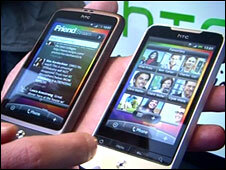 HTC launched two new Android smartphones called Desire and Legend with a revamped Sense user interface. One feature is the Friend Stream app which aggregates updates from a user's social networks on to one page. Both phones sport a new and brighter Active Matrix Oled touchscreen first seen in Google's Nexus One handset. The Legend, which succeeds the popular HTC Hero, is flatter in design. Both phones include an optical mouse instead of a trackball. 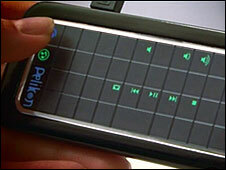 Other innovations on display included the Israeli-designed Else phone which has been designed to reach any contact, document, or application with a single touch. For people preferring to type into a phone via a real keypad, until now they have not had the flexibility of changing the buttons' functions. 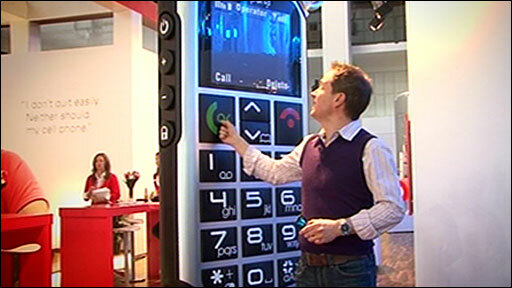 Now British firm Pelikon has produced a hybrid display that uses printed LCD layers to allow users to change the design of their keypads. For instance, letters and numbers can be changed to reveal a media player interface or transform the keyboard into one large trackpad. The company said its keypads can be added to slider phones for less than $10 (£6) and they are aiming to team up with a major handset maker this year. Immersion which produces haptics, or touch feedback, for more than 100 million phones showed off a package that enables users to decide how keystrokes should feel.